Looks like I'm going first. 2.26-2.285, depending on distance to lands and variable magazine length and feeding reliability. 2525 in 18” Lilja or JP, 2550-2575 in 20” Bartlein, 2650-2675 in 24” Satern. All quite accurate and generally low ES/SD, depending on brass and brass prep. Very forgiving to load for. Damn that load seems a bit over the max to me. Are you seeing any pressure signs? I have loaded XBR in 3 grendel barrels now and at 28.5 grains I started seeing serious pressure. Great numbers, but would agree that load is about .3gr above what is generally considered max over on Grendel forum. Betting brass and primer pockets don’’t hold for long either. Of course, everyone’s barrel and chamber are different. To those unfamiliar with Grendel, certainly wouldn’’t recommend that as a starting load, and suggest slow work up from 28.0, paying attention to distance to lands along the way. My go to load is 26.8 grains Ar-Comp in Lapua brass under a 123 Scenar or ELD seated 2.245-2.250. 20" Precision Rifles (bartlien barrel) rifle gas = 2460ish and the SD/ES were good but I'm unable to find my notes right now. No case head deformation. Primers are slightly flattened, still rounded on the edges. I've seen a handful or so of loads at the same charge as mine give or take a bit, posted on various forums. So I didn't think anything of it. I have no idea what max "book" pressure is. I start low and work up till I find a good accurate load that the rifle likes. Not worried about brass life. My buddy shoots this round in factory Hornady and gives me his brass. I already have about 800 pieces between what I bought and what he gives me. Plus I'm just not seeing any signs that these rounds are over-pressured. Every rifle is different. I haven't had any issues with it. I haven't tried running it with my can though. While i suspect not many will play with 100 grain Amax, I have a box and decided to burn some imr8208 today in my 18" JP barrel. If OCW theory holds, +3% of 30.0 = 30.9 so next time out I may try 31 grains, but given the numbers and group at 30.0... thats very tempting to remain there. what's your COAL roughly? And what is your max COAL with say a 123 Amax or 123 ELDM touching the lands? I see st the top of your target it says 2.245 COAL...How far off the lands are you? 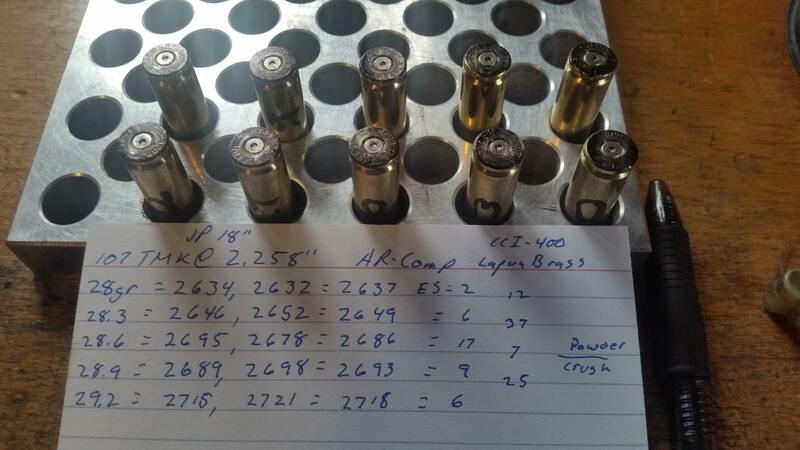 I am not sure how far the 100 A-max is from the lands, I just loaded them to what was printed in the hornady manual, 2.245-2.250. The 123 ELD is jumping about .030" and the Lapua Scenar 123 is jumping about .060". 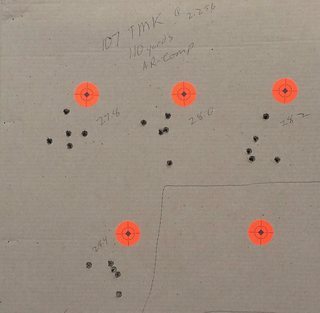 10 shot groups are around .6 consistently for me at 100 yards. Velocity testing 107 loaded to 2.258, this leaves them jumping .097" in my JP's chamber. 18" barrel, rifle gas. will punch some paper next. Have you had an opportunity to target test these loads? I'm very interested in the 6.5G and this bullet in particular. I should have some results to share this coming week. Okay but not great. Dots are 1"... going to explore some slightly lower charges and 28.6 next. If that doesn't tighten things up I'll try 8208. Thanks @Niles Coyote . I was thinking of starting with 8208 when I start to load for this round. I'll check my records when I get home. I worked up a load with 8208 as well. I'll let you know what it was. I found I got better velocity and accuracy in my rifle with the CFE223. Where’s node in terms of point of impact for loads? One round sample or multiple round average? Consistent poi for a multiple of loads a better indicator of node than two loads with similar velocity. Interested in your further results. Shoots 1.05” 10 shot groups with consistency. My rifle really likes the 130 class bullets. 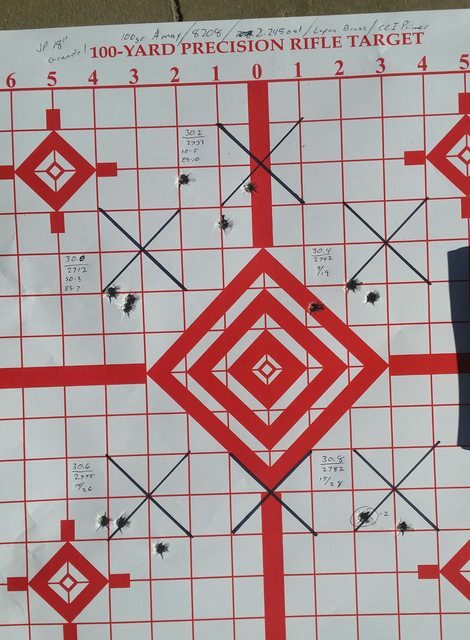 Finally got to chrono some loads that I’ve been more focused on accuracy than speed. Worked up in 20” very short throated Satern, but had to test in equally short throated 24” Satern. 2500/17ES/9.8SD. Only had three rounds to test. Not worried about SD/ES with hunting loads since they wont be used past 200 yds. I’m hoping mine does too. Will be testing the above node for groups this weekend. Showed zero pressure signs during velocity testing. 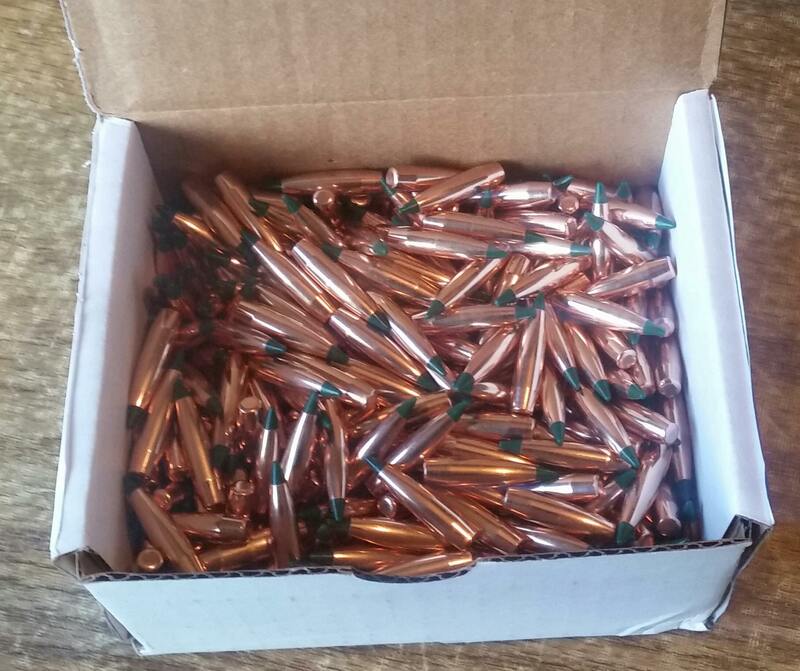 Have any of yall tried the 100 class bullets with AR Comp?